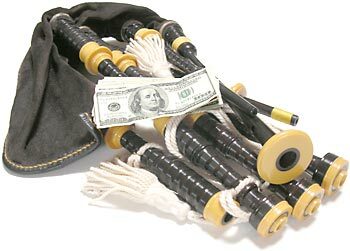 Most bagpipers like to have an idea of the value of their set of bagpipesan appraisalbe it for insurance purposes or just plain ol' curiosity. An appraiser will tell you that bagpipes are worth between $5 and about $8,000 assuming there is no extraneous intangible characteristics such as historical significance, like a set of bagpipes having been played on D-Day. Why the huge disparity? Like most things, it's the qualityor perceived qualityof the instrument. Most standard modern (last 40 years or so) wood bagpipes from a known maker will sell used for between $600 and $900, a lot depending on whether it comes with a chanter, drone reeds, drone cords, case, tied-in bag, bag cover, etc. Some are sold simply as "sticks and stocks," that is, drones and stocksno chanter or other accessories. A good set of silver and ivory mounted pipes from the early 20th century would likely sell for $3,000 to $6,000, more for immaculately engraved silver and/or a highly desired maker. Maybe add another $1,000 or $2,000 for a 19th century set. The most desirable sets in excellent condition typically top out around $8,000. Sometimes you'll see sets for over $10,000 but this is exceptionally rare. Bagpipes made in Pakistan are notoriously inconsistent at best, unplayable at worst. 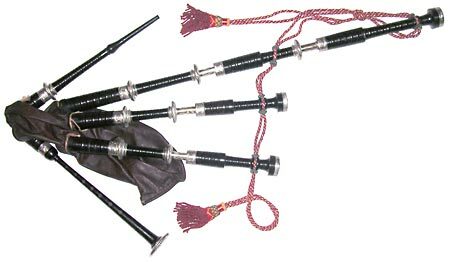 These compose most of the low valued bagpipes. Other low valued pipes would be sets which are damaged to the point of compromised sound quality, or ones that, while they sound good, have substantial cosmetic damage that would be easily visible to a nearby listenerthough sometimes this damage can be repaired. Questions to answer in determining the value of your specific set of bagpipes. "How do I know the brand?" The first, and often most difficult, step is to try to identify the maker of your pipes. Knowing the specific make of a set of bagpipes, almost without fail, increases their value—as well as easing the whole value determination process. Sometimes the maker's name is stamped somewhere on the drones, such as under the drone cords. A godsend for pipe identification—the maker's name stamped right into the drones. Assuming it's not a Third World knock-off, you're in luck. Since chanters can come and go, a name on a chanter with the bagpipes may mean nothing. Bagpipes must be visually inspected in great detail by a knowledgeable person for a good identification. This involves either taking or shipping a set of bagpipes to an expert or many very detailed and clear photographs and measurements. A poor man's approach is to post photographs and measurements to a website then post links in an online bagpiping forum, such as BobDunsire.com's Technique & Instrument forum . You'll get advice, often conflicting, but on occasion, definitive. The older the pipes, the less likely that you'll get a rock-solid answer. It should also be noted that any paperwork accompanying a set of bagpipes does not always accurately identify a maker. A story has been told of a woman who had a letter from her grandmother leaving her "a set of Henderson bagpipes." The only problem was the set was later positively identified as a different make. An original purchase receipt is typically a good indicator, but even then some makers were known to farm out or buy other makers' pipes to fill overdue orders. "How do I look for problems?" You'll want to inspect your set very closely, inside and out. Use a light to peer down the bores of the bagpipe looking for signs of cracks or repairs or other defects. Also determine if the bores are circular and haven't shrunk or worn down to an oval shape. Inspect the outside critically as well. Check to make sure the mounts and decorative woodworking matches from section to section. If they don't match, a part may have been replaced at some point. Check for warps by taking each drone section and rolling it on a smooth surface. If any part appears to wobble, it's not straight. If a warp is significant, it will affect the value. Here you can see a few of signs of age on this circa 1975 set. Chips along the rim of the cap as well as flaking of the varnish. 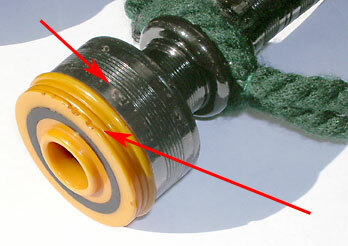 Many modern pipes come with an oil or wax coating versus finicky varnishes. Also note the dark color of the plastic which was originally off-white. "How do I know if the wood is good?" It's easier to tell if it's very bad. If the wood is painted, that is a very bad sign. Pakistani bagpipes are often painted black to make light woods appear to be prized African Blackwood. But not all valuable pipes are made of African Blackwood, pipes in the late 19th century were often made of ebony or cocus wood. And, while unlikely, it is possible that perfectly good wood was painted black somewhere along the line by someone who didn't know any better. A few signs that this is not a valuable set. Notice the true color of the wood showing through the black paint. Notice the unsightly nail holding the metal ferrule in place. Another sign, the engraving work is hamfisted. And the plating is flaking off the underlying metal. Pakistani make. The wood should have a very tight grain with no knots. Wood with significant lighter grain bands running through it is considered less desirable, but can be an indication of very old pipes when the makers could be less picky and used whatever they had available. Here we see a color difference on these stocks made of cocuswood. The lighter part of the wood is sapwood (the outer part of the plant). These are from set made prior to 1840 by Donald McDonald and, given the vintage and make, such a variation would not have a huge impact on value. "How do I know if I have poor workmanship?" Visit my page on Bagpipes Quality and read up. "How do I know if I have real ivory?" Elephant and mammoth ivory have very characteristic faint crossing lines which run consistently throughout the material. These are called Schreger lines. The angles at which these lines cross can be measured with a protractor. (Often it's easier to photocopy the ivory then measure the image on the paper.) Elephant ivory has an angle of greater than 115 degrees (averages around 125 degrees, but could run as high as 150 degrees). Mammoth is less than 90 degrees (averages around 75 degrees, but could run as low as 40 degrees). Photos and descriptions of ivory are provided online by the U.S. National Fish & Wildlife Forensics Laboratory. Also ivory will lighten with exposure to light, and darken when stored away from light. Speaking of light, a flashlight (a.k.a. a "torch" for those of you in the UK!) can be helpful in seeing Schreger lines. You may have a "pin test" mentioned with regard to determining whether a substance is ivory or not. Most experts recommend against this test. This testing method is considered "invasive", that is, it's a destructive test, even if it's in a relatively minor manner. Also, this test is not foolproof, though it can provide some strong clues. What this test involves is heating up the end of a pin over an open flame (such as a candle) and poking the suspected ivory with the red-hot point of the pin. If the substance is a resin or plastic, the pin will easily sink into the material and yield a burnt plastic odor. If the substance is biologically-derived, the pin will often yield likely a "burnt hair" odor and simply leave a small burn mark on the surface. Obviously, a burn mark is cosmetically unappealing, so if you feel that you have to resort to using a pin test, at least do it in an inconspicuous area—some bagpipe mounts even thread off in which case the pin test can be performed on an internal never-seen surface. Before you do a pin test, you might inspect the exposed surfaces for existing burn marks from previous tests! 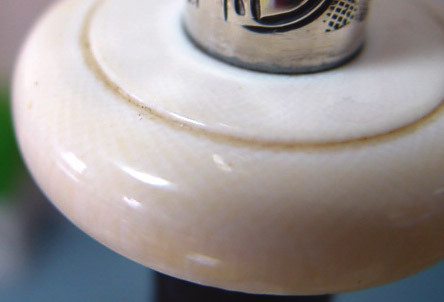 Schreger lines are very visible in this cap of true ivory. 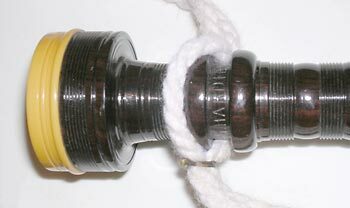 Pipe turned by David Atherton. 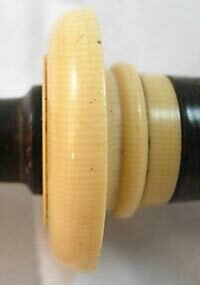 Schreger lines are also visible in this mount of true ivory. This from a set of 1972 Gillanders & McLeod pipes. The various synthetic ivories will commonly either have solid color or a swirl of colors. Some old simulated ivories were celluloid (see examples below) or even casein. Many plastics, particularly older formulations, turn from off-white to a dark orange (often referred to as "pumpkin" by pipers) with age, some even within 10-15 years. Vegetable ivories also exist and these can be tested by experts using a minute application of sulfuric acid. An excellent lab test for differentiating materials is FT-IR spectroscopy—but this is not something found on every street corner! 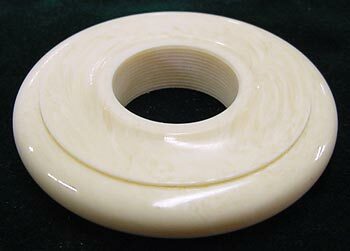 The swirl nature of the coloring betrays this synthetic ivory mount as . . . well, synthetic! Good news and bad news. You might think that this cap is made of ivory. Bad news, it's not. Notice how the there are no crossing lines, they are just parallel—no, the bush inserted at a different angle doesn't count! Good news, it's celluloid which is a synthetic from either the late 1800s or very early 1900s. A vintage set of pipes. 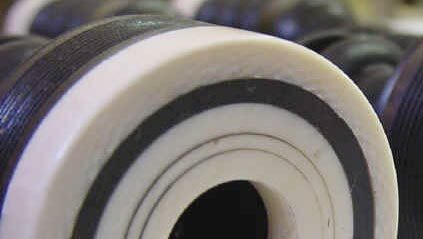 Another example of celluloid. You can see why some people are fooled into thinking it's ivory. If you were to rotate the drone on its axis by 90 degrees you'd see a different pattern by the lines. Some modern sets (such as some Hardies) have lines like old celluloid but are brighter in overall color. Lines don't necessarily mean very old pipes. On a side note, you want to be careful when transporting authentic ivory mounted pipes across international borders. Doing so requires special permits documenting the age of the ivory to prove that the ivory preceded the bans on the sale of elephant ivory, or that the ivory is derived from a mammoth or other creature. "How do I know if I have real silver?" 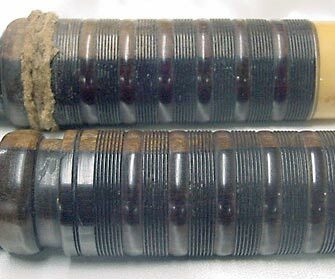 Nickel is most common for the ferrules of a bagpipe. Though you may also find stainless steel, brass, gold-plating, silver, aluminum, and other metals. 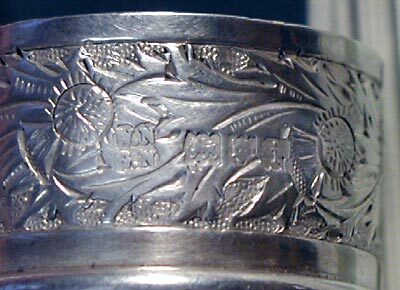 If the bagpipes originated in the UK, any silver will be hallmarked with a series of small stamps into the metal which indicate the silver content, the office which performed the assay and the year of inspection. Silver plate also can receive hallmarking, so you have to be a bit careful, though sterling silver is more common than silver plating for Western pipes. If you are unsure, consider taking your set down to your local jeweler to have him or her give the fittings a wizened eye, this can include a scratch test if necessary. 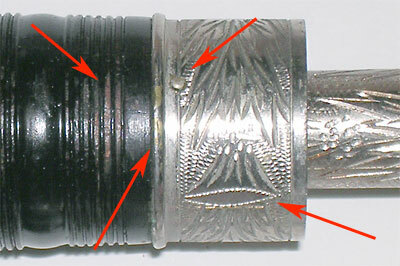 Here you can see the hallmark on the silver ferrule of a set of Hendersons. The maker's mark "WNGN" off to the left is for William and George Neal. 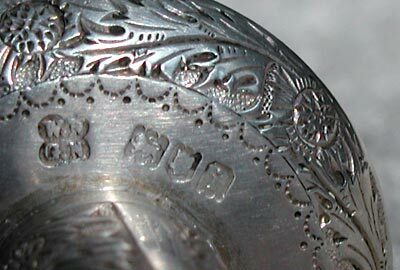 The first assay mark is the "Lion Passant" indicates British Sterling of .925 purity. (A Lion Rampant would indicate Scottish Sterling.) The second mark is a leopard head which denotes it was verified at the London Assay Office. The third mark of the lower case "i" and represents the year 1904. 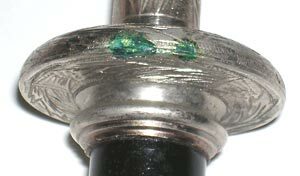 From the same set of Hendersons, the hallmark is seen at the base of one of the tuning slides. Now, here at the opposite end of the spectrum is a revisit to that Pakistani set. Here the cheap metal is corroding and you can also see the lack of integrity of the plating. If your pipes do include silver, you can check the hallmark to get a strong clue of the year they were made. But the date is fiscal, not calendar and is the date the silver was assayed, not integrated into a set of bagpipesor possibly reintegrated into a much later set of bagpipes. Unfortunately, on old pipes, sometimes the hallmarks can wear down to the point of only partial recognizability. Silver originating outside the UK is not required to have a hallmark, though some silversmiths have been known to send their silver to a UK assay office anyway. As for determining the quality of the sound, this should be done by an individual very experienced with such comparisons, or at the very least, a high-graded competitive solo piper. An evaluation by a piper with years of experience but little or no successful competition experience will probably not be fully reliable. It takes a highly developed critical ear to differentiate a good set of pipes from an outstanding set of pipes, especially without the opportunity to play them as their own for weeks on end. It should be noted that there is not always a direct correlation between sound quality and value. A fantastic sounding plain set from a modern lesser-known maker will always sell for less than an "average sounding" set of silver and ivory mounted early 20th Century Robertsons. (Just an example. I'm not suggesting that Robertsons are average sounding.) But, all things being fairly equal, a better sounding set will be worth more than a worse sounding set. "What if I need to get parts fixed or replaced?" Many bagpipe makers do repairs. It's always best to have the original maker do the repair, if they are still in business. Sometimes a dealer for that make of pipes may have extra parts laying around—if you are lucky, one the same vintage and appearance. Obviously, the older the pipes, the harder it will be to find original replacement parts. If you can't find replacement parts, repairs can often be made or new parts can be fabricated. A set with a replacement part or repaired part is worth more than a set missing a drone top, for example. 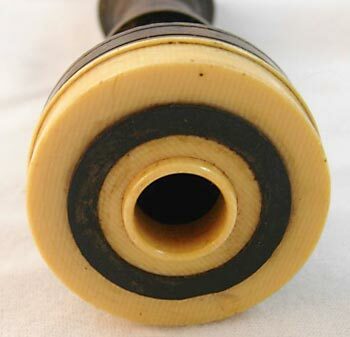 You can contact a bagpipe retailer near you for advice on where to find reputable restoration services for your pipes. "I know all about the pipes, now how do I determine their value?" Let's state the obvious. What something is worth is based on market value, that is, what someone else is willing to pay for what you have. The trick is knowing what someone is willing to pay. If knowing is just to satisfy your idle curiosity, you can investigate yourself. On the other hand, if you need a value for insurance purposes, you'll likely need a professional evaluation in writing. And whatever you do, don't sell your bagpipes to the person doing the identification or appraising. Obviously, it will be in their best interest to low-ball the price if they are purchasing the set. The following individuals' names are given solely as a service to the reader and I make no claims about their appraisal abilities. Some will be better than others, though all are fairly well-known in the piping community. Again, if you can afford more than one evaluation, particularly if yours is an old set, do so! Typically, appraisals are fairly inexpensive. Some of the individuals will also do indentification of the make of a set of bagpipes—and again skills will vary. This page last updated Wednesday, May 28, 2014. Page first created in February 13, 2007.